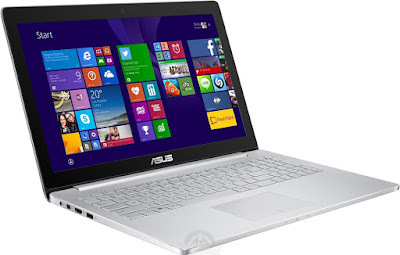 Asus not know for their smartphone but also have excellence in Laptop and their notebook series too. Asus has announced availability of their ZenBook Pro UX501 in India. ZenBook Pro UX501 is one their flagship laptop device that have an ultaportable, high-performance notebook aimed at demanding users that want high-performance with unmatched elegance. Featuring a slim and stylish form factor, the ZenBook Pro UX501 comes with 15.6-inch VisualMaster IPS display with a stunningly-detailed 4K/UHD resolution and an amazing pixel density of 282 pixels per inch (PPI). The ZenBook Pro UX501 has a 15.6-inch VisualMaster multi-touch display with a ultra-sharp 4K/UHD 3860 x 2160 resolution. This resolution is four times higher than Full HD resolution, with pixel density of 282PPI provide you detailed and lifelike images. IPS technology with wide 178° viewing angles ensures that colors and contrast are perfect from all viewing positions. At the heart of ZenBook Pro UX501 is an ultra-powerful quad-core Intel Core i7-4720HQ processor with massive 16GB of RAM ensures super-smooth multitasking with plenty of processing power in reserve. For gamers it have NVIDIA GeForce GTX 960M graphics processor (GPU) featured 2GB of fast GDDR5 video memory for smooth 4K/UHD video playback and powerful 3D processing for image and video editing. Ultra-fast storage is essential for fast boot times and effortless file operations. The ZenBook Pro UX501 features a next-gen 512GB PCIe x4 SSD with read/write speeds up to 1400MB/s that’s 16 times faster than standard SATA 6Gbit/s hard disks and twie as faster as the current generation of SSD’s. High-speed 802.11ac Wi-Fi. ZenBook Pro UX501 with wireless network connectivity three times faster than previous-generation 802.11n. Thunderbolt 2.0 connectivity provides flexible lightning-fast expansion for external storage devices, docking stations, display and a host of high speed devices. This will be available across retailers and channel partners including Flipkart and Asus Exclusive Stores for a starting price of Rs. 115,999. Here we is complete details about Asus flagship ZenBook Pro UX501 laptop. Stay tuned for more. If you have any question do comment below. Thank you for reading.